.....Paint a thin coat of epoxy over the area to be filled. Dry micro is then lumped over the area. The fill must be high, such that material is sanded away to bring the area into contour. The micro should be mixed very dry (lots of microspheres) to save weight. Let the micro cure at least 24 hours. 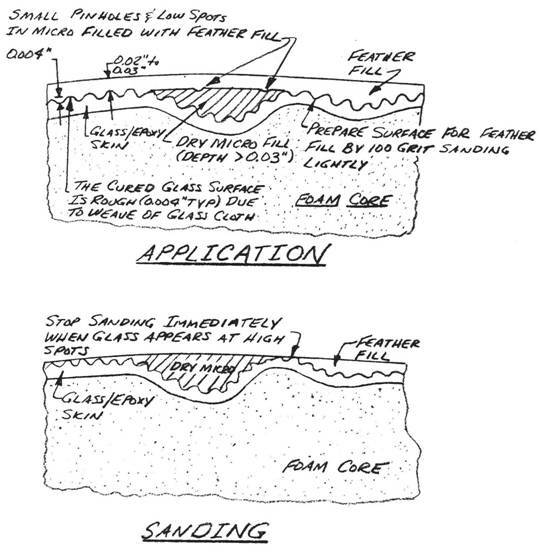 Sand the micro overfill into contour using a hard sanding block, or spline with coarse (36 to 60-grit) sandpaper. Exercise extreme caution while sanding. A few careless strokes with coarse paper can ruin your structure! ..... Sand the surfaces lightly by hand or with a soft foam sanding block in preparation for feather fill. A spray or brush coat of feather fill will build up .02" to .03" thick, fill the glass weave and any medium sized out-of-contour spots. Feather fill will require several hours curing time before it can be sanded. The cured feather fill is sanded to contour using a spline or soft block and 100-grit sandpaper. Again, extreme caution must be exercised not to damage the glass structure in pursuit of a good finish. The contouring must stop immediately when the highest glass peaks begin to be visible as the feather fill is sanded away. .....If you find that you have underestimated the fill required or just have a thin coat, don't hesitate to use a second coat of feather fill. A well prepared surface generally won't need more than one coat. When you have finished contouring the feather fill, the surÂ¬face should be basically smooth and fair. The primer to follow is not intended to be contoured heavily, just smoothed with finer sandpaper for a smooth finish while leaving a substantial ultra violet barrier. .....After you have filled and contoured, reinspect for sanding damage; it is an easy thing to do! Remember, you are only allowed to sand into the first skin ply in local areas no greater than 2 inches in diameter and all of these areas must total less than 10% of the surface area. Wherever there is only one ply, or where the UNI cloth is crossed for strength (e.g. the canard and wing skins), no sanding of the ply is allowed, except for "scuffing Upll the surface. Be Careful! ..... The ultra violet radiation barrier is provided by the heavy carbon black content of the dried primer (Dupont 70S). The primer gives the whole surface a flat black color and the sanding should never remove it completely, exposing the light gray feather fill below. The primer is sprayed on, allowed to dry, and sanded lightly to achieve a smooth surface. The first primer coat is sanded using 220-grit and the second coat very lightly wet sanded with 320-grit. When complete, the primer is very smooth, dark, and ready for finish paint. .....Follow the manufacturer's directions for the type of finish paint that you have chosen. .....It is not necessary to fill the glass weave, although some very light sanding may be done to smooth the surfaces. Apply one coat of the Dupont 70S primer to the interior glass ,surfaces for ultra violet protection prior to painting the interior. .....A light color (light grey, green, or blue, etc.) is recommended on the cockpit interior to avoid high heat buildup when the aircraft is parked in the summer sun with the canopy locked. Automotive trunk paint may also be used. Its IIspeckled" appearance will hide the weave of the glass cloth.